From the classroom to Broadway! After having taught 3rd grade for the first time in the spring semester of 2006, and being successful, I said, “I have everything it takes to be an excellent teacher — from the classroom to Broadway!” The next year, I was hired to teach all subjects in 4th grade; and in the blink of an eye, I began to prepare for the new school year. But the reality set in, and I realized that teaching is a never-ending job. So I started doing research to find a well-developed Spanish literacy solution. When the opportunity came to work with Istation, that was exactly what I did. I started designing motivating and engaging lessons to positively impact bilingual students at a large scale. I embarked on the adventure. Adventure starts in the Big Apple. Why the Big Apple? The Spanish curriculum team thought, It is a city full of cities. We took into consideration that Ellis Island was the gateway for millions of immigrants. Hence, when developing the Land of the Present, the concepts of culture, ethnicities, and nationalities were embedded in the content. Next, we created the profiles, and the artists designed the main characters. That is how Alanza, the main character, was born. She resembles a sibling, an older sister, or relative that students might have. 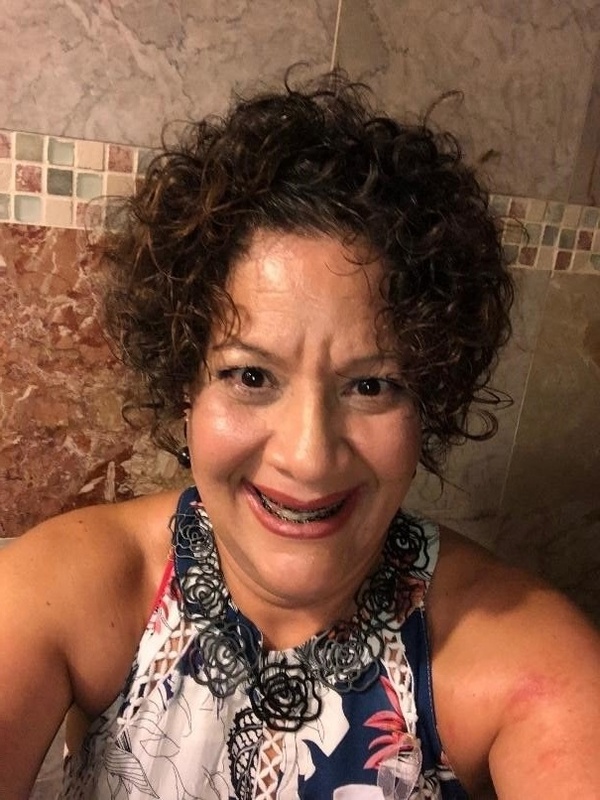 Alanza loves technology, and she’s always depending on her digital guide, Socorro (Spanish for help), who lives on her smartphone. In the Big Apple, Alanza embarks on an adventure, wandering and exploring the world around her with Socorro’s help. Alanza interacts with her friends Sofi and Hermes via text messages. This feature helps students relate to the main character. The friends help Alanza learn about genres. Further in the Land of the Present lessons, students are exposed to iconic figures such as Shakira and Marc Anthony, just as in the Land of the Past they were exposed to Don Quixote and Sancho Panza. Speaking of the lesson, let’s go a little deeper . . .
Genre, lesson, or both? Designing the present. 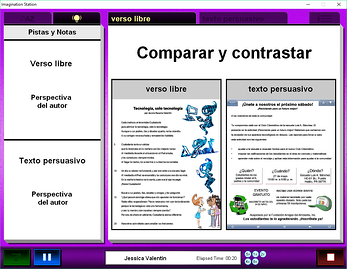 Istation Español supports bilingual classrooms with lessons in which students learn literacy skills through genres. In the Land of the Present, students learn about very important and typically forgotten genres such as lyric and free verse poetry as well as speech. The other two genres they are exposed to are realistic fiction and persuasive text. As former educators, we know that students are not frequently exposed to these genres, so we included them during the design process. We used Socorro as a digital guide and emojis for motivation and engagement when explaining the genre’s characteristics. The lesson begins with visuals, such as city maps and presentations, and students learn about author’s purpose and perspectives. Following the visual hook, the lesson continues with a guided practice comprised of two mini passages in the form of poems, letters, and flyers. In the guided practice, students exercise their agency by freely choosing each of the characteristics, such as structure, sensory and figurative language, point of view, and call to action followed by the fluent read of the mini passages. As in the Land of the Past, students show their acquired knowledge through the use of T-charts and Venn diagrams. Students end the lessons with reading a selection independently and showing their comprehension skills and understanding of the genre’s characteristics by completing a quiz. After designing the lesson came the fun part: developing the games and incorporating vocabulary acquisition, which is a critical and essential skill. 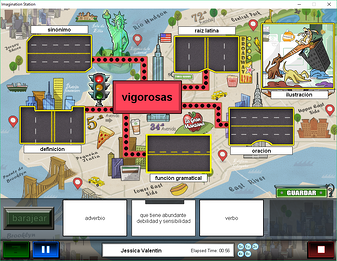 In the vocabulary games, Alanza learns about words by exploring the Big Apple, but there’s a lot of traffic. The students help Alanza by clearing out traffic while correctly matching each word with its definition, synonym, skill, sentence, and part of speech. So what does it really mean to know a word? According to research, word knowledge has multiple dimensions, from the general ability of defining a word, to applying it, and then using the word as part of the thinking process. 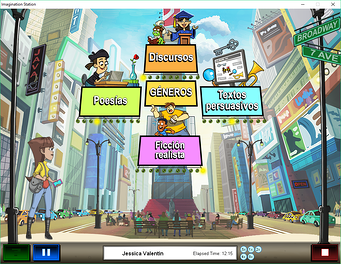 With that in mind, Istation Español created vocabulary games, bringing words and concepts that fit the stories and are especially relevant to a theme or concept and having students encounter them during their reading journey. In the Land of the Present, we also teach figurative or sensory language. For students to understand language in a figurative form, they need to know the meaning of a word deeper than the surface, applying the different dimensions. To accomplish this, the vocabulary games as well as the stories that students encounter in the genres of poetry, realistic fiction, speech, and persuasive text provide examples of figurative and sensory language, such as similes, metaphors, idioms, adages. 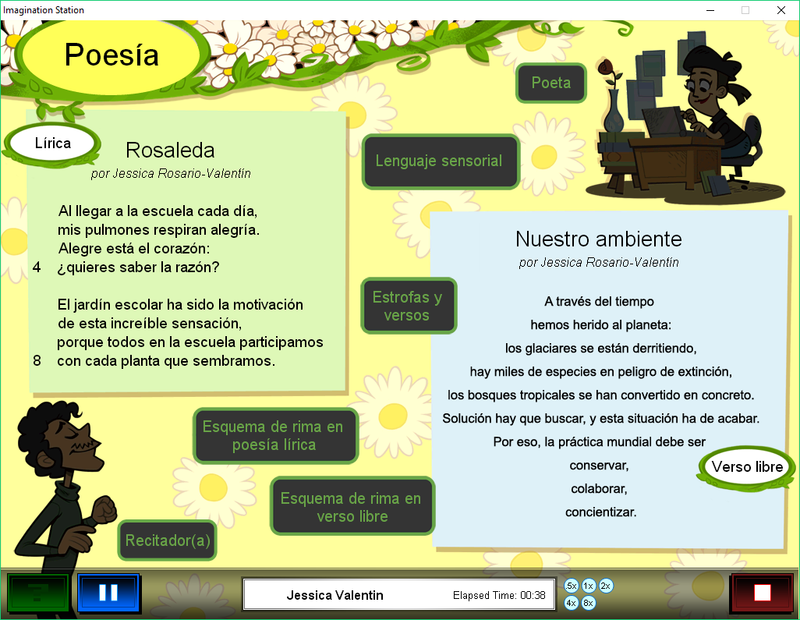 Through the Land of the Present, Istation Español empowers students by providing bilingual classroom support. So in terms of this great experience, there’s no time like the present to get started!